Spring is in the air, and the SheFlogger bids farewell to another season of ice climbing. She is sad because it means putting away her newest best friends, the Lowa Ice Expert GTX Lady boots. This was one of our most-requested reviews for women, and SheFlogger's verdict: they will seriously improve your vertical ice performance. Where I complain about making room for more sport-specific footwear, the SheFlogger embraces specialization and she is on the verge of convincing me with these boots. Light at 3.8lb but still warm down to mild negative temps, the split leather/Cordura uppers sit on top of a beefy Vibram sole with serious traction for messy approaches. The Gore-Tex liner wards off trenchfoot, and the very cool integrated Schoeller gaiters cinch around her shapely calves to keep out the shower of ice shards generated by her particularly aggressive climbing style known as "extreme cavitation." The beauty of an ice-specific boot is the stiffness for calf support. With the GTX Lady's on her feet the SheFlogger climbs farther, faster and longer, while I whine louder and lamer. Pair these with a serious crampon like the Grivel Rambo 4 and you will you smoke that waterfall like a cheap cigar. Lowa makes some great boots. The Vertex GTX is not among them. Sure, they've got the cool exo-skeleton that feeds my Robocop fantasy, and they do provide great support for moderate to heavy loads and a comfortable fit right out of the box. However the boot has two fatal flaws. First, those plastic supports on the outside of the boot squeak like little crack-addicted mice. Not the calming, communing with nature vibe you were looking for, unless you really like mice. And crack. The second flaw is even more severe: these boots are not waterproof. Not even close, really. I thought perhaps our tester had gotten over-zealous and gone wading off the deep end, but a quick review of other reviews - oh yeah, we cheat where we can - showed the same problem being reported. So if you're deaf and will only hike in the desert, carrying heavy loads, these are what you want. Everyone else, look away. 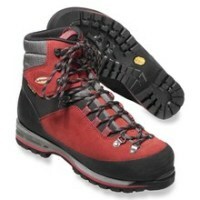 "Hike 'em or spike 'em," sayeth the Lowa marketing reps of the Mountain Expert GTX boots. Turns out they're not lying bastards. These single boots performed great out-of-the-box on a twelve-mile speed hump over varied terrain. At just over 4lb these are not designed to be light hikers, but the upside is the worse the terrain became the more comfortable they felt. And unlike some boots I've tested, the waterproof label is accurate. They were curiously warm on a recent glacier outing. They take step-in crampons well, and I had no problem making them perform on vertical ice - just be prepared for a severe case of burning calf syndrome. 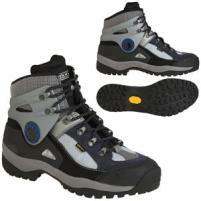 Lowa has a higher-end boot specifically designed for ice climbing. I'm used to a larger (sloppier on me) foot box in Lowa boots, and I was pleased with the closer fit on these. These boots perform well when pushing their envelope on fast hikes and vertical ice, and they really shine in their comfort zone when a double boot is overkill but light hikers just won't cut it.